Due to popular demand, we have added this awesome game into our inventory. Try to score by landing on the bars. Very fun! 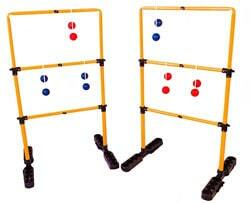 Includes 2 ladders and 6 roped balls. Surface: This game is only for use on Grass, Sand or Dirt.